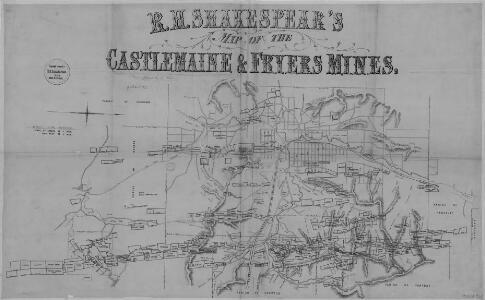 R.H. Shakespear's Map of the Castlemaine and Fryer's Mines. Scale, 24 chains (1584 feet) to 1 inch. Victorian Water Supply. Plan shewing Auriferous Gullies in the Castlemaine and Fryerstown Mining Divisions commanded by the Coliban Scheme. Scale, 40 ch[ain]s to one inch. 1 : 5512320 Tallis, J. & F.
Description: R.H. Shakespear's Map of the Castlemaine and Fryer's Mines. Scale, 24 chains (1584 feet) to 1 inch.